Let your imagination run wild in a world of visionary expression and multi-sensory indulgence. 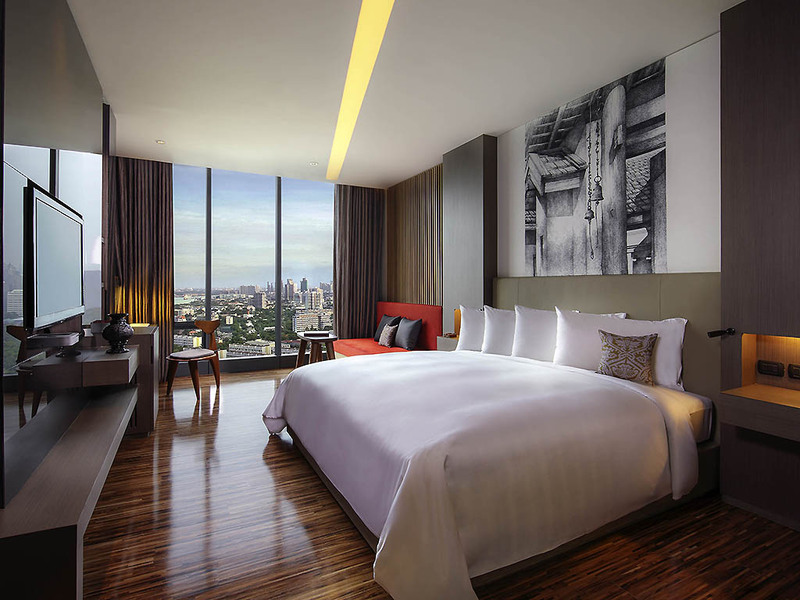 Situated on the corner of Sathorn and Rama IV Roads SO/ Sofitel Bangkok is an intrigue-steeped 5-star hotel with a resolutely contemporary outlook. At the heart of it all The Tree of Life - an emblem designed by famed couturier and design legend Mr. Christian Lacroix - combines the five elements of Water Earth Wood Metal and Fire into uniting icon. 237 themed rooms and suites created around The Five Elements. 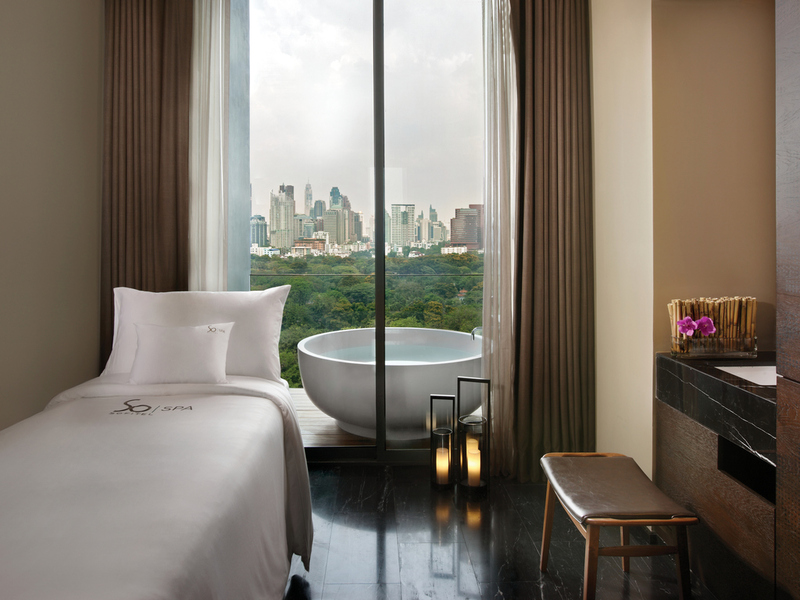 Savor our serene infinity pool and delight in panoramic views of Bangkok's skyline. Designed by five Thai designer and signature designer Christian Lacroix. Visit HI-SO, our vibrant rooftop bar with custom-made cocktails and stunning city views. Located on prime location of Sathorn road overlooking Lumpini Park. A true masterpiece, SO Sofitel Bangkok was designed around Water, Earth, Wood, Metal and Fire. 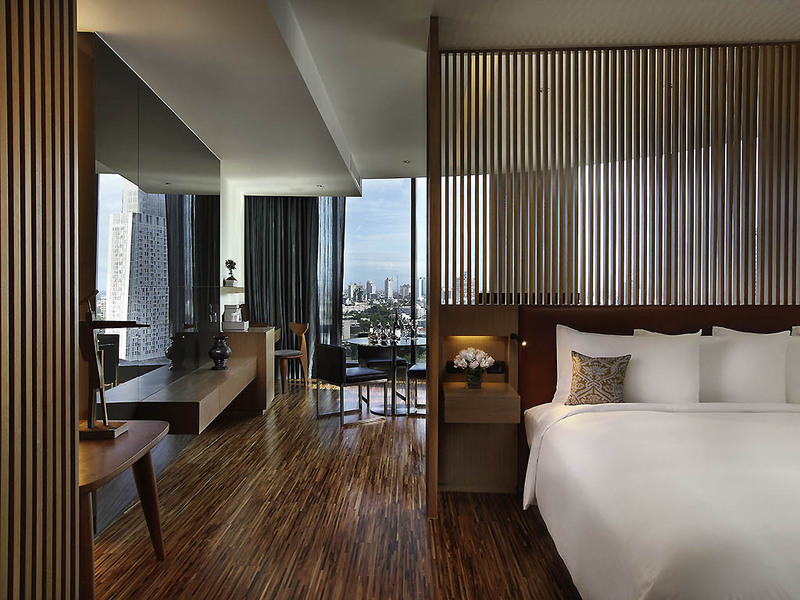 In the heart of Thailand's vibrant capital, SO/ Sofitel Bangkok is a luxurious urban hotel where design meets pleasure. A mélange of Thai culture and French elegance, this masterpiece embodies the Five Elements: Water, Earth, Wood, Metal and Fire. A collaboration of Thailand's top five designers and world renowned fashion designer Christian Lacroix, SO/ Sofitel Bangkok is elegant and refined, yet casual and approachable. This harmonious haven is the first truly urban design hotel in Bangkok. 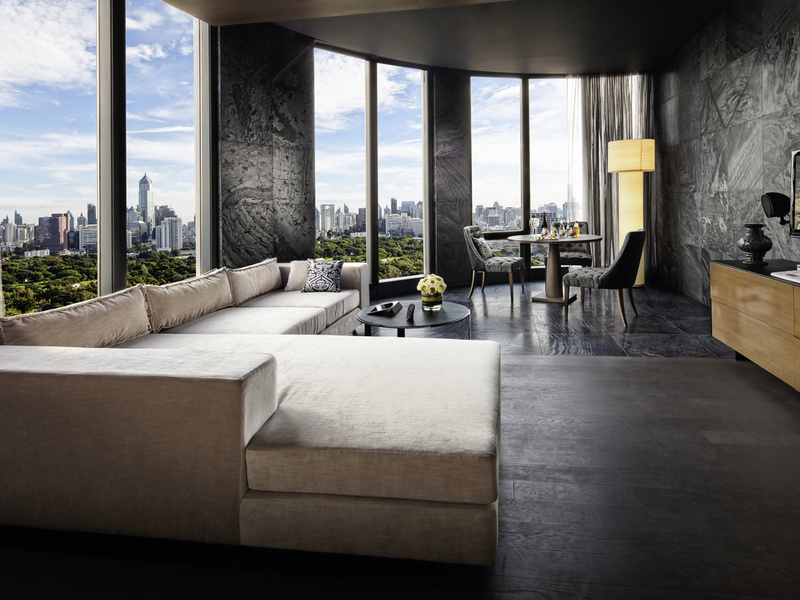 A seductive statement of art and design, this 30-story hotel offers enchanting views of Lumpini Park and the city skyline. Each guest room features Water, Wood, Earth or Metal elements, floor-to-ceiling windows, a lavish bathtub and a serene rain shower. After exploring the city, retreat to the sparkling infinity pool at SO Sofitel Bangkok to take in panoramic cityscape views. Retire to your enticing room and soothe your senses within its cocoon of earthly comforts, sumptuous colors and tranquil textures. Only 25 km from Suvarnabhumi International Airport. Travel by car or taxi along the Rama IX expressway and turn left onto Sukhumvit Road. Continue toward Bangna Dao Kanong before exiting at Rama IV. Turn right after the exit and continue driving along Rama IV. You will notice the hotel situated on the left side. The 237 rooms and suites have distinguish themes; Water, Earth, Wood and Metal. 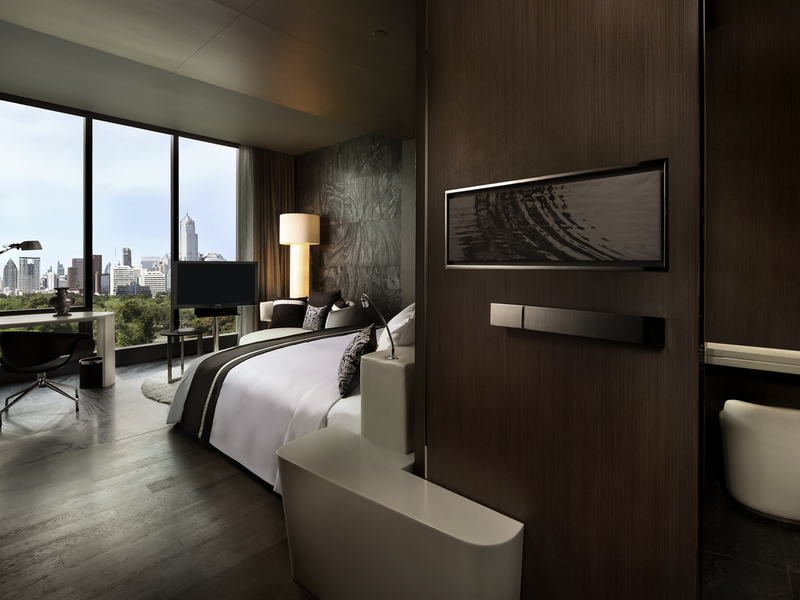 Each one of our guestrooms boasts floor to ceiling windows with panoramic views of Lumpini Park and the city skyline. Featuring free WIFI with Apple® Mac mini. For premium categories, guests will enjoy a visit to the Club Signature, an executive lounge inspired by world renown fashion designer Mr. Christian Lacroix. Club benefits range from breakfast, afternoon tea, evening cocktails to free WIFI and more. 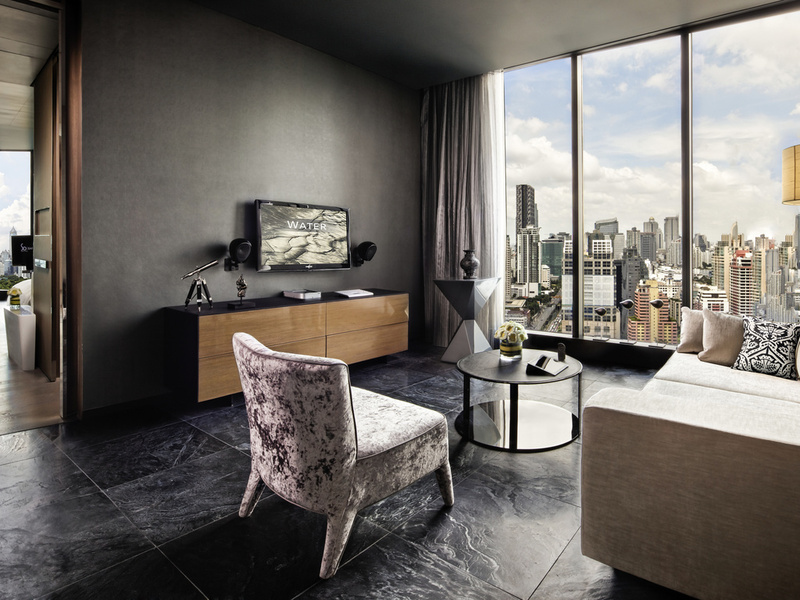 Indulge your imagination in the lavish suites at one of Bangkoks most exciting design hotels. Choose from spaces embodying the 4 elements -Wood Earth Metal Water- as well as unique Spa Suites. Christian Lacroix designed amenities add a fashionable touch. 38 m², stunning city view, Sofitel MyBed, separate rain shower and bath, 40" LCD TV, Apple Mac Mini, free high-speed WIFI, free daily minibar. Choice of metal, wood or earth room, subject to availability. 38-45 m², park or city view, Sofitel MyBed, separate rain shower and bath, 40" LCD TV, Apple Mac Mini, free high-speed WIFI, free minibar, illy coffee machine. Choice of metal, wood, water or earth room, subject to availability. 38-45 m², Lumphini Park view, Sofitel MyBed, separate rain shower and bath, 40" LCD TV, Apple Mac Mini, free WIFI, free minibar, illy coffee machine. Club Signature benefits, choice of metal, wood, earth or water room, subject to availability. 65-74 m², city view, Sofitel MyBed, separate rain shower and bath, 40" LCD TV, Apple Mac Mini. Free high-speed WIFI, free minibar, illy coffee machine. Club Signature benefits, choice of metal, wood or earth room, subject to availability. 67-89 m², forest themed bedroom suite and Spa room, Sofitel MyBed, a daily 90-min Spa treatment for 2 people, 40" LCD TV, Apple Mac Mini. Free high-speed WIFI, free minibar, illy coffee machine. Club Signature benefits, wood element suite. 85-94 m² suite, Lumpini Park or city view, spacious living area, Sofitel MyBed, 40" LCD TV, Apple Mac Mini. Free high-speed WIFI, free minibar, illy coffee machine. Club Signature benefits, choice of earth or water suite, subject to availability. 95-120 m² suite, Lumpini Park or city view, spacious living area, Sofitel MyBed, 40" LCD TV, Apple Mac Mini. Free WIFI, free minibar, illy coffee machine. Club Signature benefits, choice of metal, wood or water suite, subject to availability. 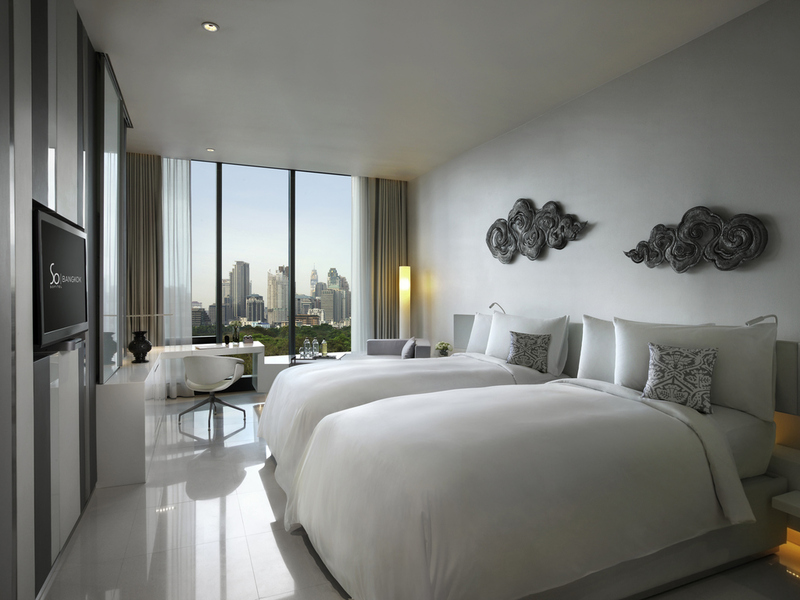 233 m², 2-bedroom duplex suite in water theme, Lumpini Park view, Sofitel MyBed. Master bedroom, guest bedroom and living room. 8-person Jacuzzi, kitchen, 55" LCD TV, Apple Mac Mini, free WIFI, in-room private bar, and Club Signature benefits. Designed by none other than Mr. Christian Lacroix Club Signature on So Sofitel Bangkoks 25th floor is a fashionable lounge welcoming guests staying in the premier luxury accommodation of the hotels So Club and suites. Oversized murals designed by Mr. Christian Lacroix draw from Siam 19th century France and the world of haute couture. Amidst the sumptuous space guests savour private breakfasts canapés cocktails fine wines and a variety of exclusive privileges. The 5th element Fire comes to life on Sathorn Road in SO Sofitel Bangkok's luscious gourmet restaurants. Two executive chefs ravish your senses in rooftop and indoor venues conceived by famed restaurant concept developers the UKs Gorgeous Group. Bangkok nightlife rises to new heights of style in the moonlit cabanas of HISO rooftop bar where personalised butlers attend to every need. Overlook Lumphini Park from the 9th floor cocktail bar Mixo as you explore the liquid world of molecular mixology. Enjoy traditional street food fare with a contemporary twist at our world food market. Visit our charming chocolaterie and laboratory for the most decadent indulgences in town. Delight in culinary creativity and skyline views at our award-winning Park Society restaurant. Captivate your senses as an array of surrounding city lights of Bangkok playfully converge into this chic rooftop restaurant and bar. An exclusive area; HI-SO offers moonlit cabanas with a glittering city view by night, perfect for intimate moments. Perched over the view of Lumpini Park, a perfect haven for socializing and observing the life of Bangkok with the city backdrop. Experience a new dimension of molecular cocktails by mixologist while a mix of chill-out tunes sets the mood. Enjoy the outdoor poolside bar on the 10th floor with light refreshments & cocktails. The host venue of the monthly SO Pool Party on every last Saturday of the month, partygoers are invited to enjoy casual bites & cocktails for parties under the stars. SO Sofitel Bangkok offers the most stylish meeting venue in Bangkok, fully equipped with the latest technologies such as LCD screens, projectors, AV and free WiFi. Our creative space such as THE BOX is perfect for intimate and exclusive meetings. Experience the Ballroom and four loft-style meeting rooms with an open-kitchen pre-function area providing a contemporary twist of the modern day meeting. In any case our InspiredMeetings planner will make sure you get your perfect meeting. For larger affairs the Ballroom offers up intrigue in a modern interpretation of a Parisian opera house complete with 2 full wall HD projection screens. Hovering over Bangkok on the 9th floor The Box is an intimate venue for unique private gatherings. SO Sofitel Bangkok s weddings celebrate with a flair for the spectacular - imaginative themes, creative spaces, playful, luxury, surreal romance. The art de recevoir meets modern art in each fabulous magnifique event. Passion rules the day in the wedding planning services at SO Sofitel Bangkok. Your planner brings artistry, elegance, creativity and heart to every detail of your celebration. Share your inspirations and create a masterpiece. The creativity of SO Sofitel Bangkok's wedding design expertise extends to the culinary character. Talented chefs create immaculate displays of flavour, colour, form and fragrance. Choose from a variety of modern gourmet cuisines and wedding traditions. Wedding guests and participants stay in extraordinary style in 237 guestrooms and suites ranging from 38 m² to 138 m². Choose from 4 design themes, each featuring luxurious amenities and state-of-the art multimedia-entertainment-Internet technology. Banquet with an avant-garde elegance in the Ballroom's modern take on a Parisian opera house. Host a garden party in the solarium with a beautifully mad 'Wonderland' theme. Celebrate at the rooftop Park Society with details to echo Paris or Asian glam. 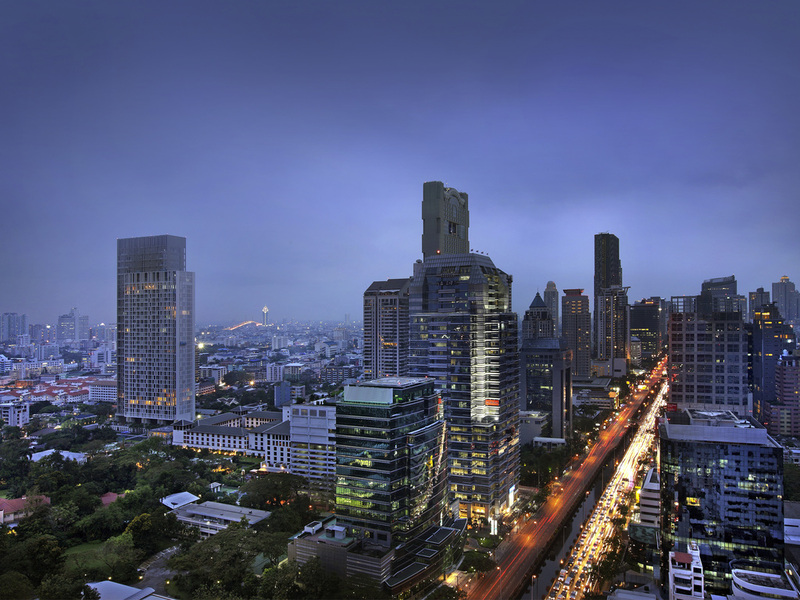 SO Sofitel Bangkok is located in the very heart of the city at the corner of North Sathorn and Rama IV Roads. Out-of-town wedding guests will find Bangkok at their doorstep with MRT Subway and BTS Skytrain station just steps away. Step into a Bangkok luxury spa with design inspired by the mythological Himmapan Forest of Thai tradition. So SPA features the refined French products and treatments of Cinq Mondes merging in mystical harmony with Thailand's Ytsara and ancient rituals. Make the most of your stay with a full range of 5-star luxury hotel services. Experience Bangkoks nightlife as a VIP with assistance from the well-connected concierge. Explore designer fashions and chic boutiques with So Bangkoks shopping consultant. Join us as we explore everything SO Bangkok, and what's hot in the City of Angels. For guests with a Big Appetite for life, we have cherry picked the most magnifique happenings in the Big Mango - classic art de vivre with a distinctive Thai twist. Extending over 32 meters on the 10th floor, the infinity swimming pool is a luxury lap pool with low chlorine content. The water seemingly flows over the negative edge into the park and skyline beyond, giving the impression of swimming in mid-air. Float over the city in the infinity pool with underwater music and soothing park views. Bathe your skin in the tropical sun at the nearby solarium. Pump up for your health or a quick body boost before a night on the town in 24-hour So FIT.